Real Estate takes backseat to POWELL Everytime!! Salt Lake City Real Estate Gaining Momentum - I am OUT of Here!! This happens every year. The Real Estate Market in Salt Lake City is reaching it's most active and productive time of the year.. 80% of my Real Estate business in Salt Lake City takes place during the months of May thru Oct. July 4th is pretty much the hottest time of the year for Real Estate in the Salt Lake Valley. My phone is ringing, the birds are singing! I have appointments daily with both Home buyer's wishing to purchase a property in Salt Lake City and Home Owners wishing to sell or list a home with a licensed Realtor!! I love calls and appointments. I have prospects that need PR work. I have CMA's for homes in Herriman and Draper to complete. Open Houses this Weekend in Holladay. Scheduled appointments to show homes in South Jordan and Sandy, Utah this evening. Yes, Real Estate is keeping me busy!! Fantastic you say? I agree! Here lies the problem. 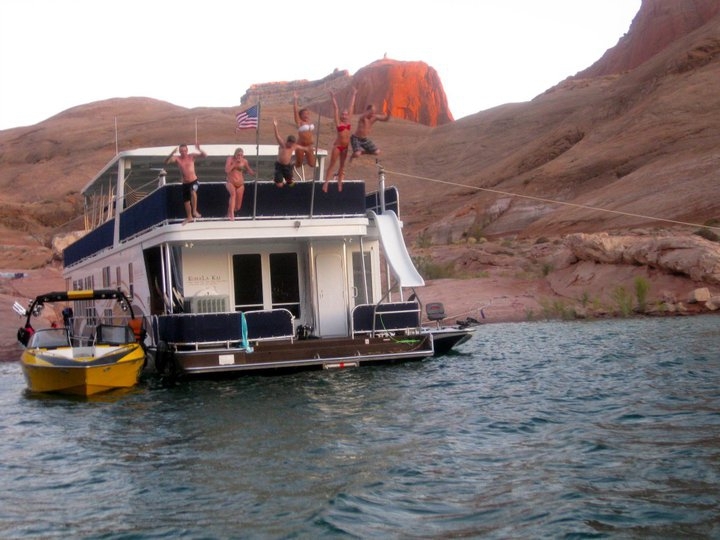 Every year we spend the week of July 4th at Lake Powell. I lov e this Lake. I have spent many vacations over the last 30 years with family and friends at this favorite playground. If i only had one vacation to choose in a lifetime it would be spent on this Lake. So why do I question taking time off from Real Estate to enjoy my passion? I said question, I never really consider not going on this vacation and the remainder of this post will be dedicated to showing you why I won't lose any sleep over a few lost Real Estate transactions. 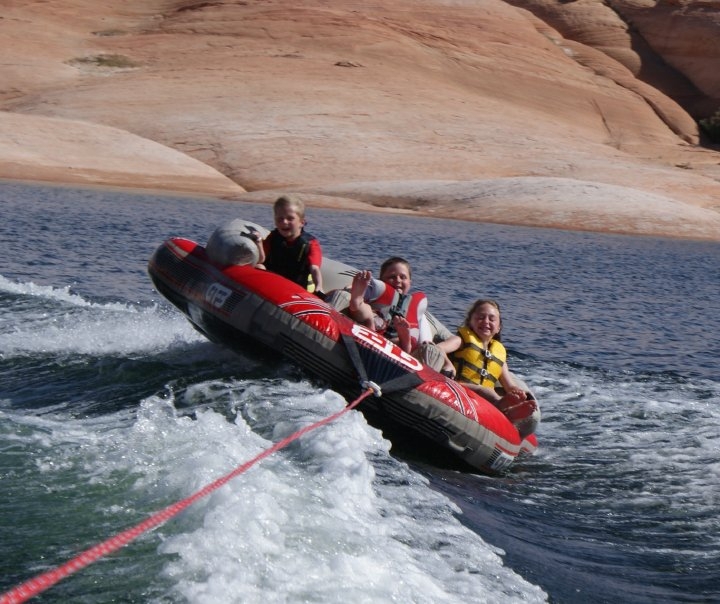 SALT LAKE REAL ESTATE TAKES BACK SEAT TO LAKE POWELL EVERYTIME! 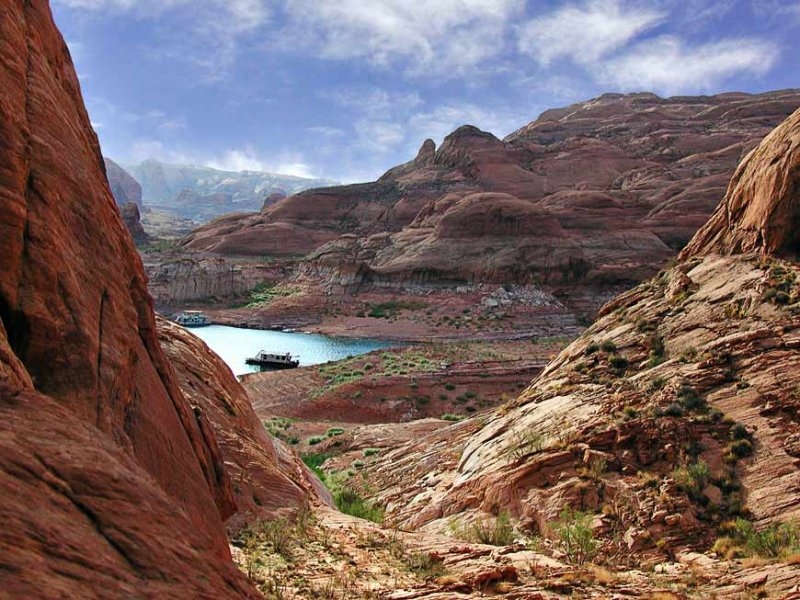 Lake Powell is part of the Glen Canyon National Recreational Area where five million years of erosion has carved canyons out of the sandstone walls and barren landscape. 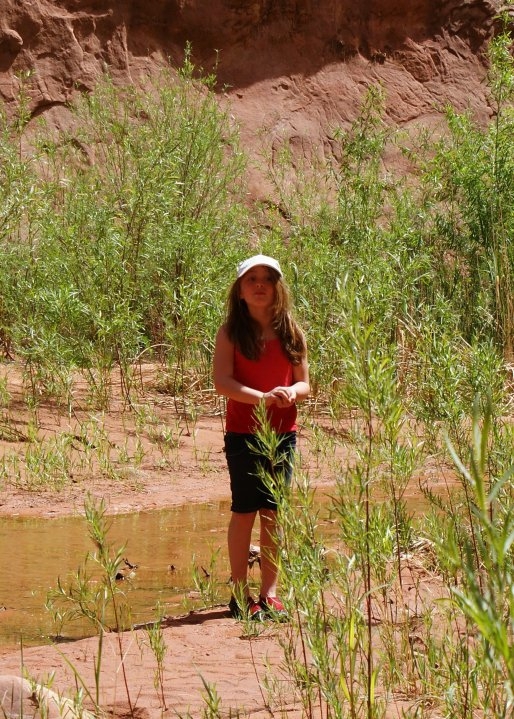 Adventure and exploration of the many canyons and coves are my favorite activities. 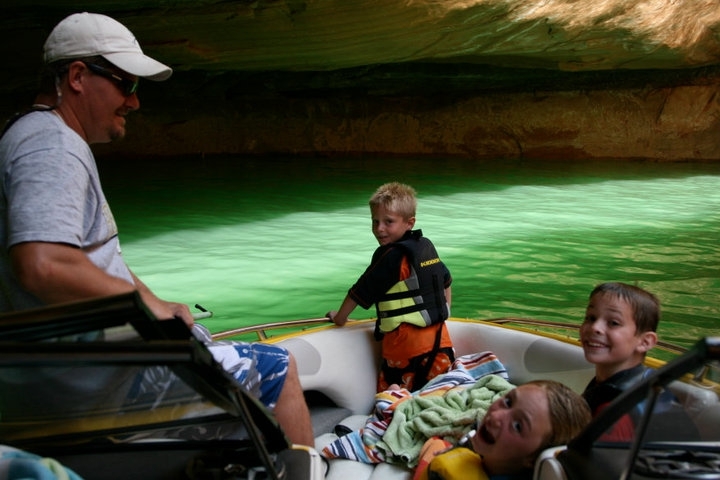 In this pic we are slowly easing the speed boat down a narrow canyon with towering walls and emerald green water. In some canyons you cant see the sky because the cliff walls are so high. I love this pic. We are just beginning a hike in West Canyon. 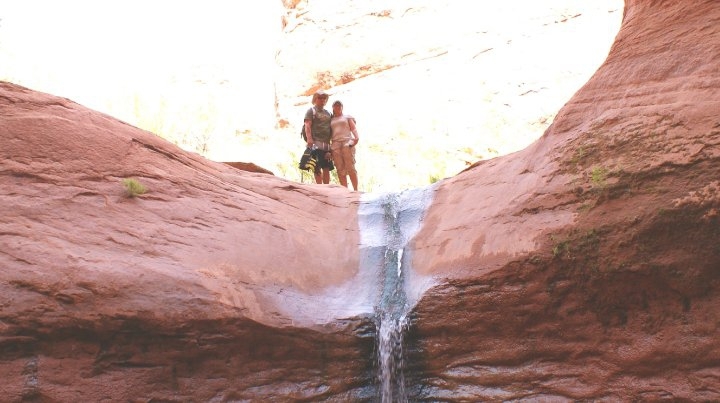 My kids love this Slot Canyon and West is really the most scenic and fascinating hike I've experienced. Depending on the Lake Level one begins a few hundred feet from a waterfall and follows the stream up the canyon through beaver ponds and areas of green wetland. The green valley in a sea of RED ROCK is so beautiful. 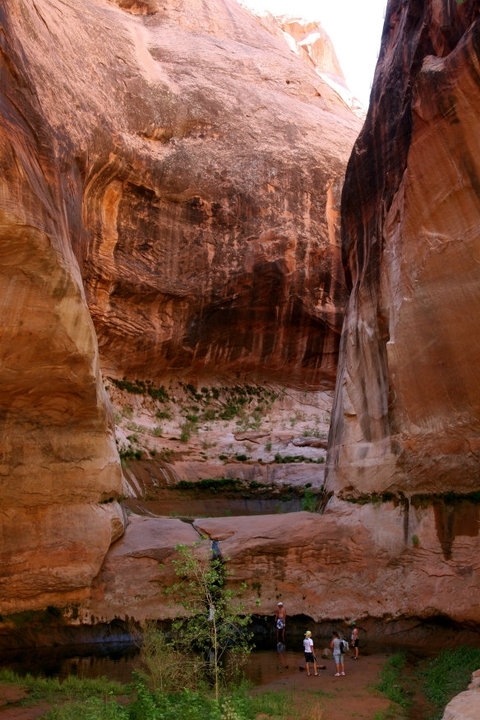 This is the start of the Slot Canyon. The big deep pools had to be swam across from this point on and cameras and phones were left behind. This Slot canyon is amazing. Swim across deep pools and through narrow slots for about 1/2 mile and then it opens back up. Kids chased and caught poly wogs all the way back to the boat. 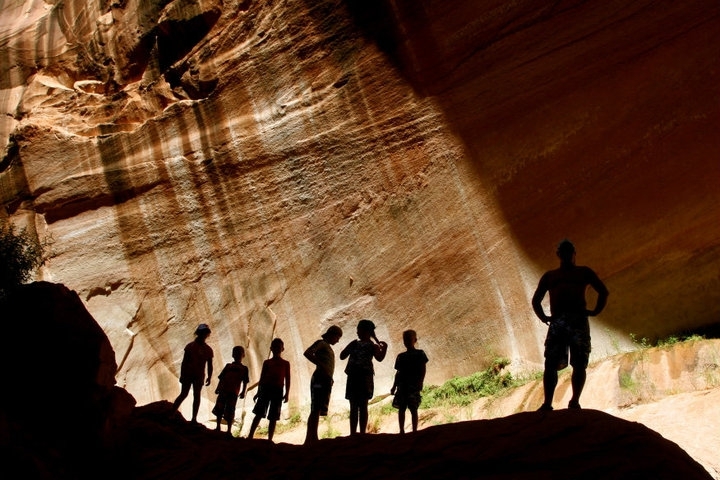 Lake Powell has many canyons to explore and no man can do it in one life time. One thing everyone visiting this lake should remember is the distance to medical help can be great. always use good common sense out on the big pond. High winds have nearly swamped my boat on numerous occasions and as beautiful as this Lake is most the time, it can get ugly in a hurry. I was once anchored in a cove near Oak Canyon for 3 days as the wind blew so hard anchor ropes gave way several times. 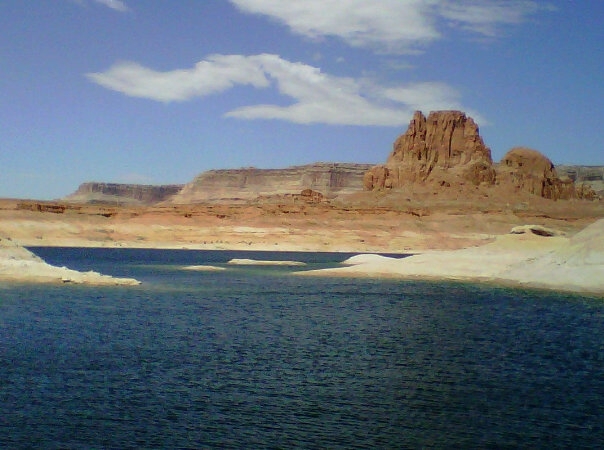 Watch the weather at Lake Powell and beware of the wind. If you get caught in a BLOW find some cover and stay put. The main channel can be very dangerous during a storm. 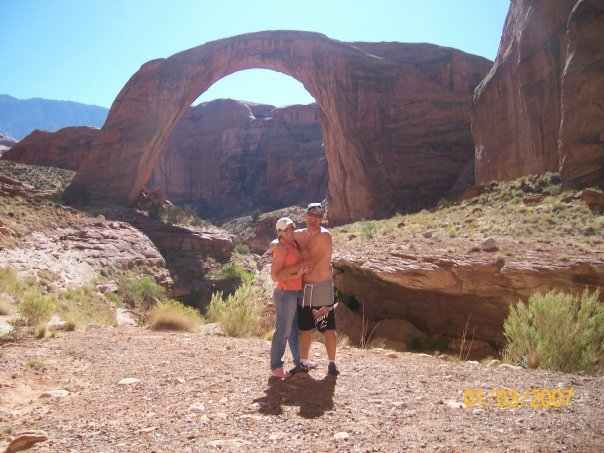 I cant write comments on every photo but here are some great pics of West Canyon and Lake Powell. Some pics I have are much more scenic but I don't want to make friends or family upset by sharing personal photos with the world. 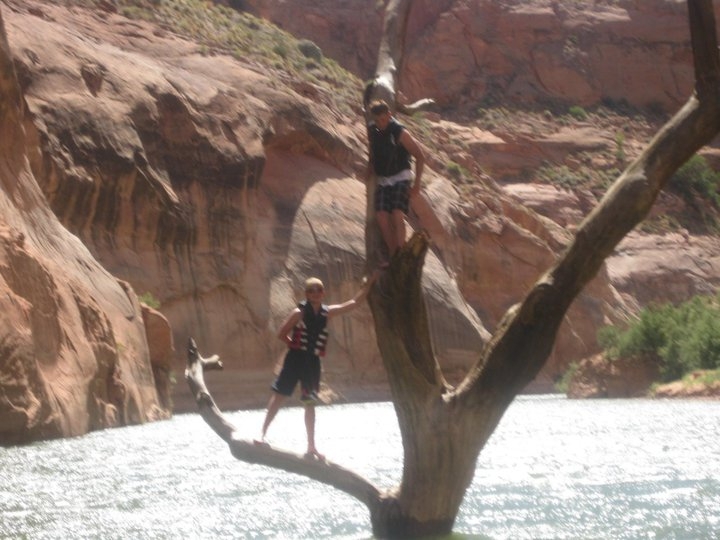 Lake Powell Rocks and if you haven't been go and if you have been I'm sure your making plans to do it again.. The thing about this Lake is the Water Levels rise and fall creating a whole new look with each season. Beaches appear and disappear with each visit. Nothing is ever the same at Powell! Boating up West you will see this tree near the end of the Canyon. Tie or anchor you vessel just around the corner about 500 yards beyond this tree. I have also taken Bass off a watermelon tube jig near this tree. 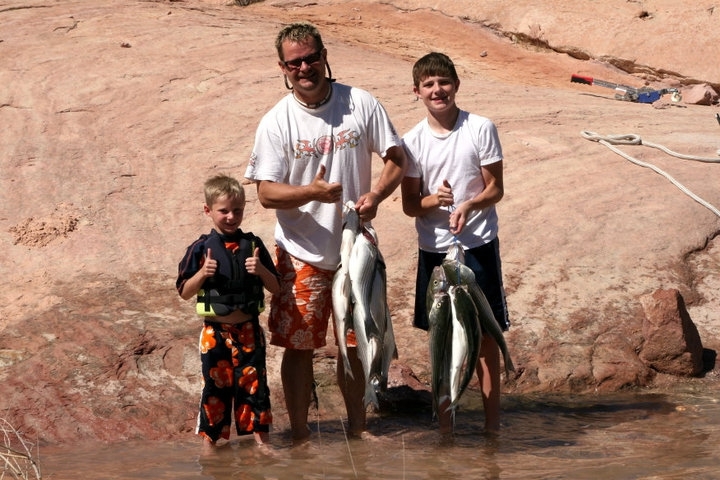 THE FISHING AT POWELL CAN BE EXCEPTIONAL FUN FOR BOTH MAN AND KIDS! STRIPED BASS,LARGE AND SMALLMOUTH BASS, CRAPPIE AND CATFISH. I try and go in the Spring time every year around the 1st of May. The Bass and Crappie are spawning and aggressive. If you like to fish plan a spring fishing trip to Powell and go to www.wayneswords.com for Lake Powell fishing and recreational information. BASE CAMP IS NOT TO BAD EITHER!! WAKEBOARDS, SURFING, WATER SKIING, OR RIDING THE TUBE. 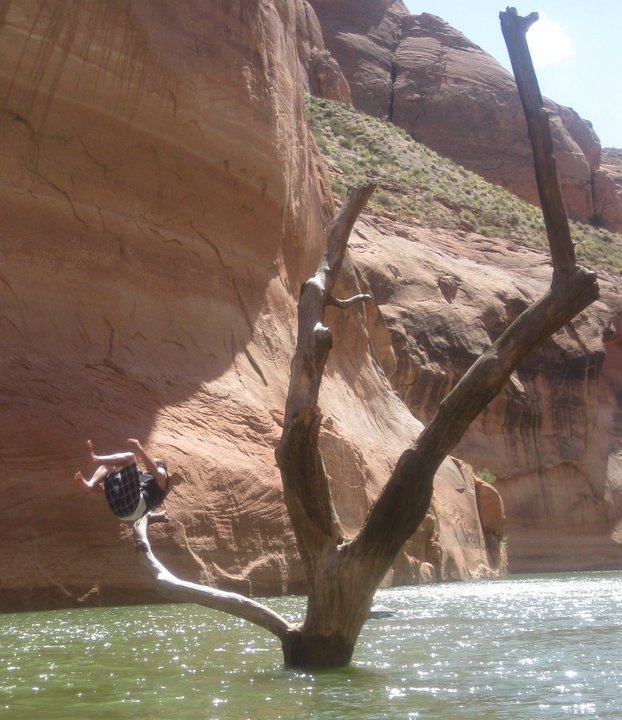 It gets hot at Powell so don't go if you don't enjoy Water Sports. Afternoons are spent pulling kids, teaching kids and getting wet! Come on in the WATER IS FINE!! The following are Pics of Rainbow bridge and miscellaneous Powell shots.. I don't know why I can't find any good pics of ancient Indian ruins but they can be found in many areas of Powell. Remember to leave it as you found it unless it is trash. Take that with you when you leave and always try and leave a campsite cleaner than you found it. 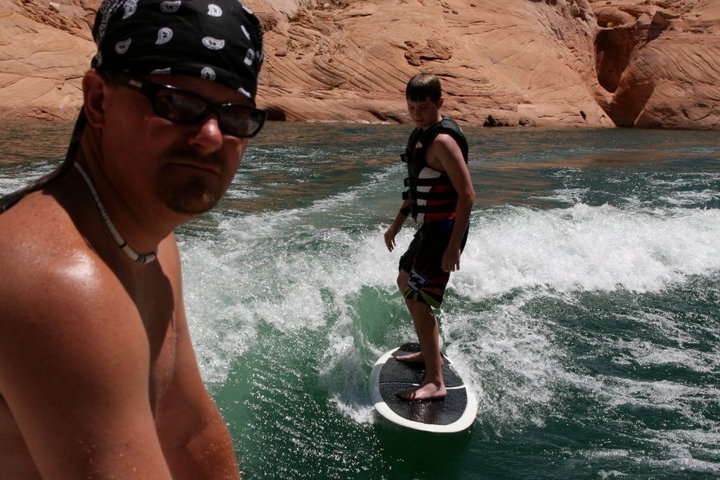 Lake Powell is such a awesome playground we must do what we can to protect the place! Well thanks for reading my post. I am so over it. Whatever feelings of guilt or hesitation to take time off from SALT LAKE CITY REAL ESTATEhave vanished. Am I even a Real Estate Agent? I would much rather be a tour guide at Powell. Just seeing the pics and writing about Powell has gotten me so excited. To all my friends and family who aren't making this years trip. You will be missed. For my clients, and home buyer's. Don't fear. Unless I am offered a job guiding at Powell I will be home on the 9th of July. Revitalized and Energized. Salt Lake Real Estate is on hold!! I will make sure to have another great post with pics of this years trip so subscribe to my Blog and start planning your trip to LAKE POWELL!